There are many reasons why select Latvia as a place for establishing the manufacturing facilities for the production for the needs of the group. Among other advantages we may mention excellent geographic location, developed infrastructure and qualified work-force. In this article we focus on an advantage of Latvian tax rate and available functional models of the manufacturers frequently used in practice. The income of the Latvian companies is taxed with the corporate income tax at a flat rate of 15%, the effective tax rate for the companies operating in the free-ports and special economic zones may be reduced to as low rate as 3%. If the group operates in the high-tax countries, it makes sense to consider structuring manufacturing operations in Latvia thus allowing taxation of a part of the profits in Latvia, thereby reducing the overall tax burden for the group. 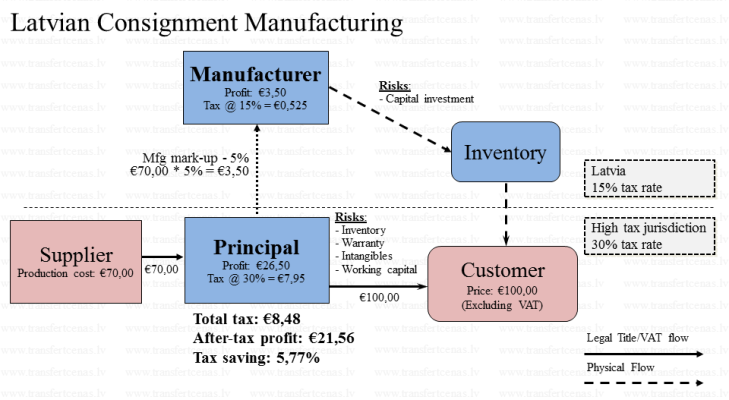 If a company manufactures goods in a high-tax country, where the corporate income tax rate is, say, 30%, and given that the cost of raw materials cost per unit is (EUR 70), but the sales revenue per unit is 100, then the profit of EUR 30 will be taxed at 30% tax, resulting in the tax liability of EUR 9 (for simplicity reasons in the example we assume that the manufacturer has only raw materials cost, all the other costs are ignored). If, however, the company establishes the manufacturing entity in Latvia and outsources the manufacturing function from the Latvian subsidiary, the tax burden depends on the selected functional model. The profit taxable in Latvia depends on the functions undertaken and risks assumed by the Latvian manufacturer. So, the larger part of the profit the group intends to transfer to Latvia to be taxed at 15% (or even 3%), the more functions and risks should be transferred to it. A consignment manufacturer produces goods for the account and risk of the principal (distributor). The consignment manufacturer does not take title of the raw materials at anytime during the manufacturing phase. Consignment manufacturer assumes limited risks, mainly associated with manufacturing (technological, quality etc. ), therefore, the profit attributable to such manufacturing is relatively low. In the example, we assume that the consignment manufacturer should earn 5% mark-up on the costs of the raw materials (here and below all the figures are invented for the illustrative purpose only). As a result, part of the profit (€3,50) is taxed in Latvia at 15% rate, reducing the total tax burden from €9 to €8,48 (by 5,77%). In practice the toll manufacturer model is frequently used if a manufacturer undertakes one or few manufacturing phases, e.g. processing or assembly of the goods. A contract manufacturer produces in its own name and account however at the risk of the principal (distributor). The main difference between the consignment manufacturer is that a contract manufacturer purchases raw materials and sells the produced goods to the principal. However, all the manufacturing is done under the instructions of the principal. Thus, a contract manufacturer assumes the inventory risk for the raw materials purchased. This means that the remuneration receivable by the contract manufacturer is higher than compared to a toll manufacturer. In this example we assume that the contract manufacture earns 10% mark-up on raw material cost. Contract manufacturing model provides more flexibility for the manufacturer for selection of the raw material suppliers, it usually has negotiation power for sourcing the materials. This model is commonly used in Latvia. A Fully-Fledged manufacturer produces in its own name and for its own risk and account. The fully fledged manufacturer is responsible for sourcing raw materials, undertaking production and potentially selling to third parties on its own risk, as well as, to related party distributors. It assumes a range of risks related to markets and owns intangibles related to the manufacturing process, products and possibly trade marks. Such entities are sometimes classified as profit centers. The profit attributable to the fully-fledged manufacturer should be much higher than compared to the previous manufacturing models. In the example we assumed it to be 15% mark-up on the raw materials cost, giving profit taxable in Latvia amounting to €10,50, taxed at 15% – €1,58. As a result the tax saving in this case would be €1,57 (€9 – €7,43) or 17,5%. For the groups selling the goods in the high-tax countries this model, in combination with a limited (low) risk distributor in the high-tax country, may appear to be the most tax-efficient, since it allows taxation of a considerable part of overall profits in Latvia. This model is frequently used by Latvian origin manufacturers that expands their sales within the EU, by establishing representative offices, limited risk distributors or agents within the respective country where their products are being sold. Assisting on your business start-up in Latvia, including establishment of the entity in Latvia and required tax planning. Advising all of the Latvian taxes: corporate income tax, VAT, personal income tax, social insurance etc. Our international practice and experience allows us to provide tax compliance and efficient accounting services for the branches, permanent establishments and subsidiaries of the foreign investors and ensure the compliance for expatriates working in Latvia. Preparation of the transfer pricing documentation to verify cross-border transaction compliance with the arm’s length requirements.